Annie was rescued as an orphan on August 12, 2005 from the Halifax River near Port Orange, Florida. At the time, she was just a little over four feet in length and weighed only 70 pounds. Newborn manatee calves are generally about four feet long and weigh about 65 pounds, so Annie was too young to be on her own. She was taken to SeaWorld Orlando to grow and gain weight, and it was there that she met her friend Rocket. Rocket was also an orphaned calf who had been rescued in 2006 at Blue Spring State Park. Annie and Rocket were together in rehabilitation at SeaWorld, and they were released at the same time at Blue Spring on February 11, 2008. On the day she was released, Annie was much bigger than when she was rescued. She was about eight and a half feet in length and weighed 1,055 pounds. Both Annie and Rocket were “tagged” so they could be monitored for successful adjustment to the wild. 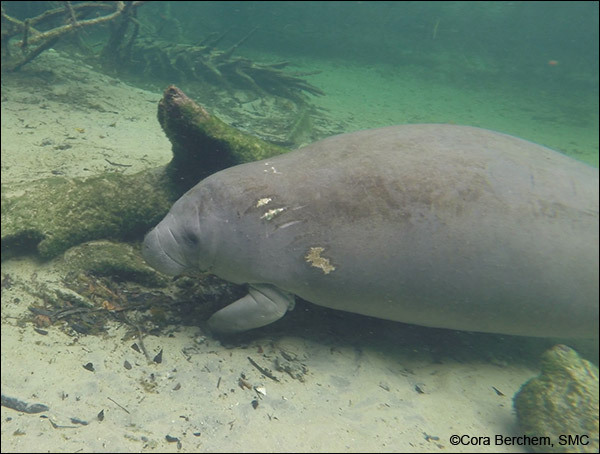 The tag consists of a belt that fits around the base of the manatee’s tail, and a tether attaches a floating transmitter to the belt. The tag is designed with a “weak link” so it will break loose if it becomes entangled in vegetation or debris. Annie surfaces to breathe. This photo was taken on October 31, 2017. We are glad to report that the adjustment of Annie and Rocket to the wild was a success and both tags have since been removed. Still, the two manatees stayed together, although they were almost four years old and should have been going their separate ways. In 2012, Annie turned seven, and she was very pregnant when she visited the park. Female manatees usually have their first calf at age five or six, so Annie was a bit late, but not by much. Her calf, a male named Arron, was born in Blue Spring at the end of June. For two or three weeks, Annie and Arron hung around the park. Volunteers, many from Save the Manatee Club, had to be organized to keep people from disturbing them. 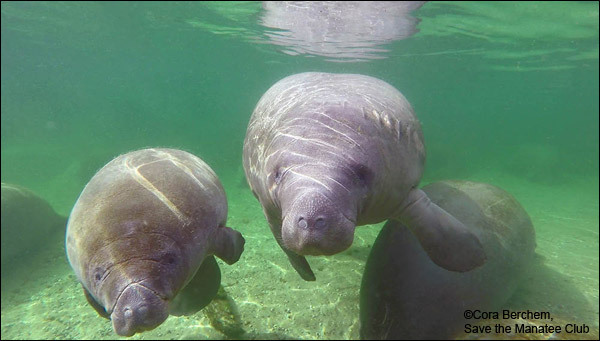 When Annie and Arron came back for the winter, they were the center of a small pack of juvenile manatees that wanted to nurse. Fast forward to 2014, and Annie came in to Blue Spring toward the end of July very pregnant. On July 26th, she once again had a calf at the park — this time a female. You can see a video of Annie and the calf shortly after the calf arrived. 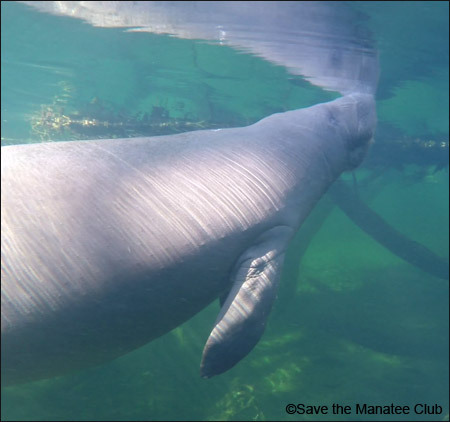 But when Annie and the calf came in for the winter, a group of juvenile manatees again gathered around her to nurse, and the calf was observed to be losing weight. A capture was organized in early February 2015, and it was found that Annie was also underweight to a dangerous point. Annie and the calf were taken to ZooTampa at Lowry Park for rehabilitation, where zoo staff named the calf Naui. In the latter half of March, Annie and Naui returned to Blue Spring looking fat and healthy. Watch the video of their release back into the wild. On August 15, 2016, Annie gave birth to her third calf, a female, at Blue Spring State Park. Annie and the calf visited the park several times after she gave birth. Unfortunately, Annie received a new boat strike sometime after that. You can see the healed scars on her left side, near her head and shoulder. In August 2018, Annie gave birth to her fourth calf at Blue Spring! Watch video of Annie and her latest calf. Annie and her third calf on February 19, 2017. Watch video footage of Annie and her calves at Blue Spring State Park. The “A’s” on Annie are freeze brands, which are used when a manatee is being tracked and has no other identifying markings.